In July 2016, UNHCR issued its Regional Plan: Building Resilience and Solutions for Afghan Refugees in South-West Asia. Covering 2016 and 2017, the plan is embedded within the framework of the Solutions Strategy for Afghan Refugees to Support Voluntary Repatriation, Sustainable Reintegration and Assistance to Host Countries (SSAR). It was presented in the context of Afghanistan’s precarious security situation, a major push factor behind the outflow of Afghans towards Europe, while the Islamic Republics of Iran and Pakistan have hosted 2.5 million refugees for more than three decades. With the end of Ramadan, the rate of refugee return from Pakistan to Afghanistan has increased significantly, and has now surpassed initial projections for 2016. While only 7,804 refugees returned during the first six months of 2016, in July and August alone 72,585 refugees returned primarily from Pakistan, an increase of over 830 per cent in comparison to the beginning of the year. At the current rate, UNHCR projects that 221,000 refugees may return by the end of 2016. Several factors are contributing to the increase in the number of refugee repatriations. Enhanced border management measures were introduced at the Torkham border crossing between Pakistan and Afghanistan, requiring every Afghan to be in possession of a valid national e-passport and Pakistani visa. In addition, while the validity of Afghan refugees’ Proof of Registration (PoR) cards was provisionally extended to the end of March 2017, refugees are increasingly anxious about what may happen at the expiration of validity. Further, a number of returning refugees have reported incidents of harassment and decreased levels of acceptance by hosting communities. They also expressed unease about increased levels of security operations in Pakistan, despite assurances from the relevant Pakistani authorities as to their safety. The increase in the number of returns is having immediate repercussions on the integration/reintegration of returnees in Afghanistan, compounding the challenges they face in accessing basic services, securing land tenure, adequate shelter and job opportunities, particularly for the youth. The doubling of the repatriation grant to $400 per person on average – as foreseen in the Regional Plan and announced by the High Commissioner during his visit to Pakistan in June this year – aims to address these initial challenges and refugees interviewed upon arrival in Afghanistan are confirming the importance of this support. The Conclusions of the Tripartite Commission meeting between the Governments of the Islamic Republics of Afghanistan and Pakistan and UNHCR in July 2016 reaffirmed the commitment to the principle of voluntary return and the Solutions Strategy for Afghan Refugees. It also further stressed the need to create an environment conducive for voluntary repatriation and sustainable reintegration in Afghanistan, particularly by integrating returnee needs within national development planning processes across relevant line Ministries. 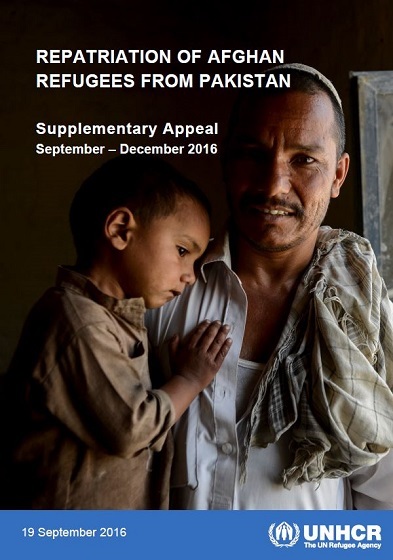 Against this background, this Supplementary Appeal presents the additional financial requirements for the Regional Plan to adjust to the evolving situation for the remainder of 2016, given the total number of projected returns of Afghan refugees have been adjusted upwards to 221,000. The response will continue to focus on monitoring and advocating for safe, voluntary and dignified returns of Afghan refugees, and supporting the initial phase of their integration/reintegration through the payment of repatriation grants.